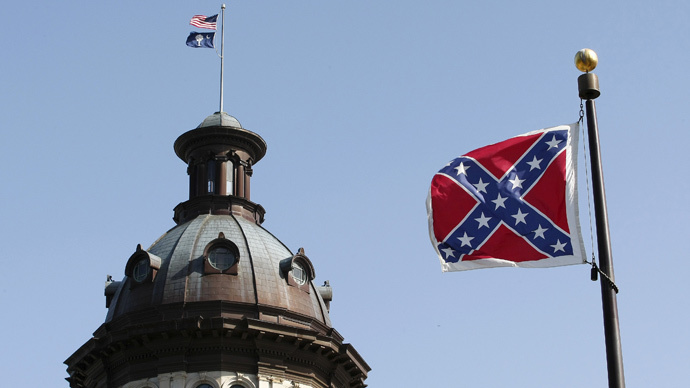 Dozens of Confederate flags were flown over public parking garages in Charleston, South Carolina, in protest after a black activist previously arrested for removing the flag from the state house flagpole was invited to speak at a local university. The College of Charleston invited Bree Newsome to deliver a lecture titled, “Tearing Hatred from the Sky,” on February 22. Newsome is best known for climbing up the flagpole outside the South Carolina State House in June 2015 and taking down the Confederate battle flag that was on display there. 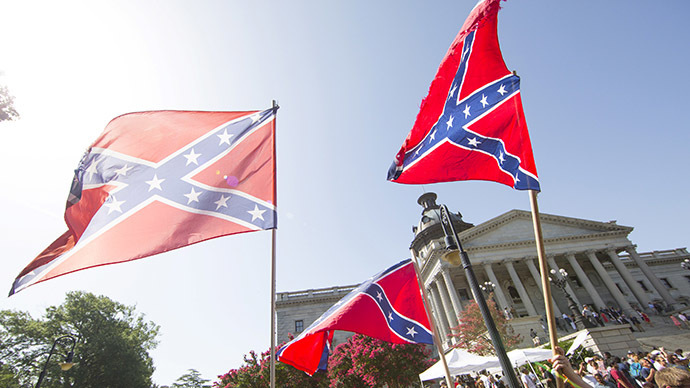 To protest Newsome’s lecture, members of the South Carolina Secessionist Party and Confederate Flaggers put up the banners in downtown Charleston on Sunday. The flag was used by the armies of the Confederacy during the failed attempt by eleven Southern states to break away from the US in 1861-1865. The stunt quickly drew counter-protests on the city’s Marion Square. Some were holding signs that read, “We will not tolerate hate,” “Black lives matter," and “Stand against racism,” according to local media. The group said they consulted the police before putting up the flags, and were told it was within their First Amendment rights to free speech. Charleston authorities reacted on Monday by banning all “signs, banners, flags or other displays” that would extend above the perimeter wall of the city garages. “This notice makes it clear that city garages are for parking, not for these types of public displays, and it applies to any and every one equally," city spokesman Jack O'Toole said. 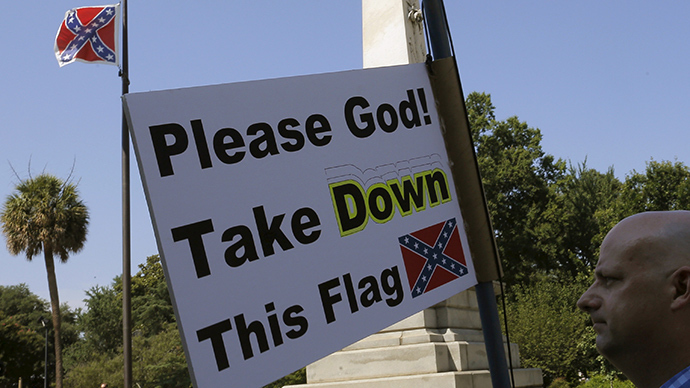 While many white Southerners regard the flag as a symbol of their heritage, the majority of African-Americans regard it as a symbol of racism and slavery. Protests against the flag went into high gear after the June 2015 murders of nine black parishioners at the Mother Emanuel AME Church in Charleston. The attacker, Dylann Roof, told police he wanted to “start a race war.” He was convicted on 33 charges of federal hate crimes in December 2016 and sentenced to death in January 2017. Activists pointed to a photograph of Roof holding up a Confederate flag and a gun to argue that the banner was a hate symbol. South Carolina was the first Southern state to secede in 1861. 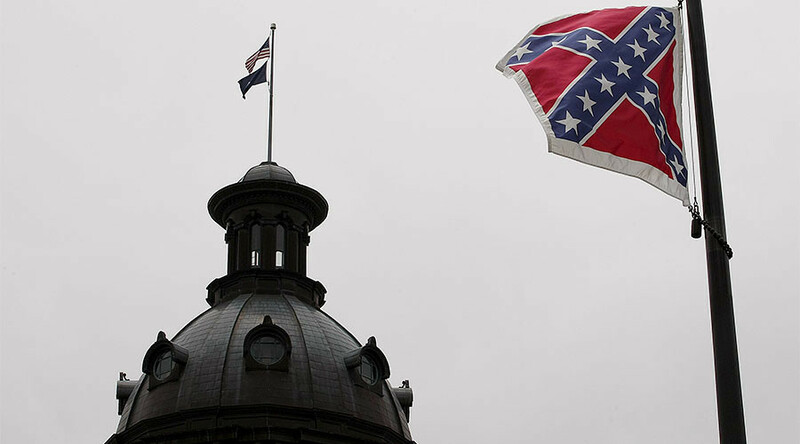 The Confederate flag was raised above the statehouse in 1962, and moved to a flagpole on the capitol grounds in 2000. Within two weeks of Newsome taking it down, the legislature voted to remove the flag permanently and donate it to the South Carolina Confederate Relic Room and Military Museum.